When it comes to security in Parramatta, CitiGuard will always see you safe and sound. No matter which diverse corner of this beautiful city you live, work or play in, CitiGuard has every aspect of security under control. CitiGuard’s dependable security services are 100% Sydney-based and feature alarms, guards, monitoring, CCTV and more. What’s Parramatta security all about? From historic sandstone buildings, the delicious delights of Eat Street, and so much else that is happening in Sydney’s second CBD, CitiGuard can be relied on for Parramatta security. Your Parramatta business, home, and family are always safe and sound with CitiGuard. Parramatta security alarms: What’s better for peace of mind than an Australian-made security alarm? CitiGuard can also handle your back-to-base alarm monitoring for extra serenity! 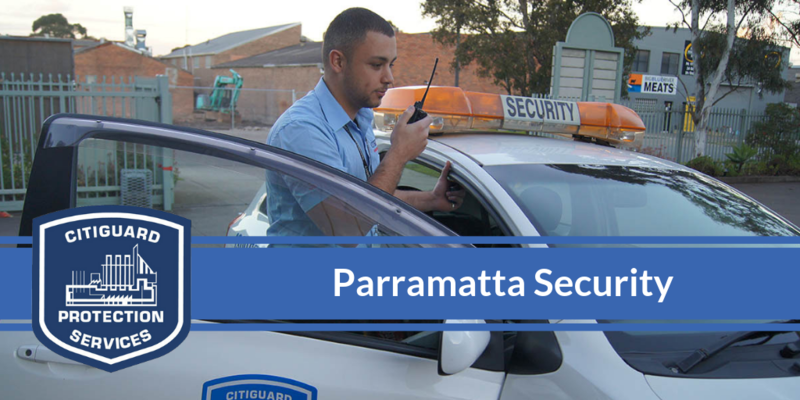 Parramatta security guards: Our alarms will keep you safe and sound, but CitiGuard is also proud to be one of Sydney’s most trusted security guard hire services. Whether you need a permanent or short-term solution, our guys are qualified, licensed and experienced. Parramatta security cameras: Add in a security camera installation done by CitiGuard Protection Services, and you’re really relaxing in beautiful Parramatta. You’ll be amazed what sort of custom CCTV package we can put together for you. Parramatta security patrols: Parramatta vandals and thieves should be warned, because CitiGuard is the best security patrol service in the region. We also solve the problem of forgetful staff members with our mobile lock-up service. Parramatta access control systems: Because the security of your Parramatta premises is our business, we want you to have full control over who gets in. Ask us about what a state-of-the-art keyless entry access control system can do for you. CitiGuard id the no. 1 Security Services for Parramatta locals. They also serve different areas in Sydney including Sydney CBD, Inner West, North Shore, Northern Beaches, Western Sydney, South Western Sydney, & Hills District. Parramatta peace of mind is just around the corner! The friendly guys at CitiGuard are waiting for your call! There’s always something happening in the rich cultural scene of Parramatta! An Aboriginal heritage site and the geographical centre of Sydney, Parramatta is proudly the second oldest settlement in Australia. As CitiGuard has been in the Parramatta security scene for half a century, we’re just as proud of this great city as the locals are. Some of Australia’s earliest colonial buildings are still standing, but there’s also so much other incredible history, heritage, art and dining to explore in amazing Parramatta.